Valentina Kulagina, 1929. Photo: Gustav Klutsis. 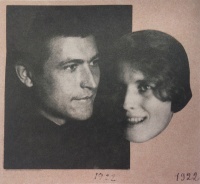 Gustav Klutsis and Valentina Kulagina, 1922. Photomontage by Gustav Klutsis. Valentina Kulagina (Валентина Никифоровна Кулагина-Клуцис, 1902, Moscow – 14 December 1987, Moscow) was a Russian graphic designer active in Moscow. Like her husband, Gustav Klutsis, she employed the technique of photomontage but sometimes combined it with stylized figures close to Art Deco. It is likely that she collaborated without credit on some of his work. She was responsible for the photomontage design dedicated to Siberia in the Soviet pavilion at the 1937 Paris International Exhibition. The ‘deforming perspective and scales’ were criticized by Soviet Photo, a signal of a hardening line against experimentalism in photography comparable to that taken in painting earlier with the establishment of Socialist Realism. This page was last modified on 15 November 2017, at 14:35.